The outdoor exhibition season is fast approaching; make sure you're ready with an outdoor flag. We offer the most competitive and easy to buy promotional flags on the market, meaning we are sure to have a suitable solution for every brand. Why Choose a Promotional Flag? Offering maximum brand impact for outdoor events and exhibition, our flag range is versatile and functional and can be used indoor or outdoors in all events. Whether it's a trade show, sporting event, festival, country fair or a front of business promotional tool - printed flags are a cost-effective way to raise your brand awareness in high footfall areas. Our simple 3-step ordering process alleviates the stress of choosing which event flag and base is right for your budget. Committed to delivering a cost-effective display solution, we offer all our promotional flags with a choice of eight bases for one great price. This means you don't have to worry about paying extra for a suitable base; what you see is what you get. Simply choose your flag shape, size and your base, and we do the rest - it really is that simple. We even include a free carry bag and a free artwork checking service wit every outdoor flag order to ensure maximum quality with no hidden charges. Our flag range includes Feather flags, Teardrop flags and Sail flags. 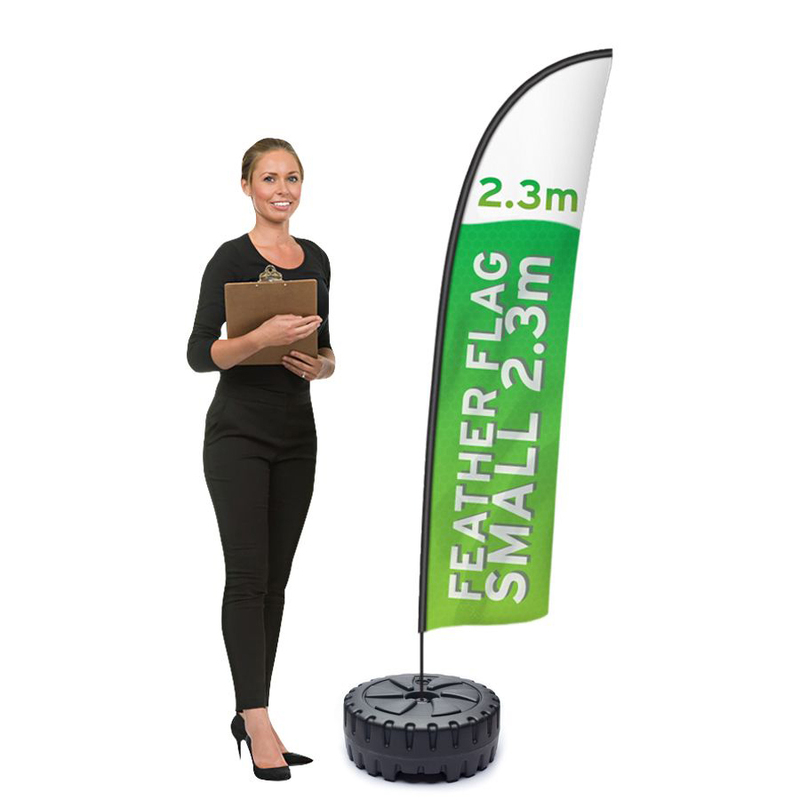 Feather and Teardrop flag shapes are available in four sizes – small, medium, large and extra large for those needing maximum brand visibility. Sail flags are available in a choice of 3 sizes - small, medium and large. We also offer each shape and size of promotional flag as a flag and pole only product with the availability of separate bases. This is so our customers can tailor their event flag kit to their exact event needs. Single and double-sided graphics are available. The double-sided graphics are manufactured using two pieces of 115gsm flag knit material which are stitched together with a liner to prevent show through form the other side. We offer a wide range of outdoor flag bases which are suitable for all types of terrain. Our best selling and most versatile flag base is the large water base. The 30L hollow base features a rugged design which is suitable for use with any size and shape flag. It can be used on any surface and, once weighted down, the flags can withstand wind speeds up to 18mph. The small water base has an internal capacity of 26 litres which can be filled with water or sand. This water base is for use with the small and medium event flags only. The ground spike is for use on soft ground only and needs to be driven into the ground for secure anchoring. The large cross base should be used in conjunction with the weighed water ring. This can be used with all sizes, small, medium, large and extra-large flags. The drive on car foot is a popular choice for use in car showrooms and car forecourts as it requires the car wheel to keep it in place. This provides high level branding for promoting car brands or offers. 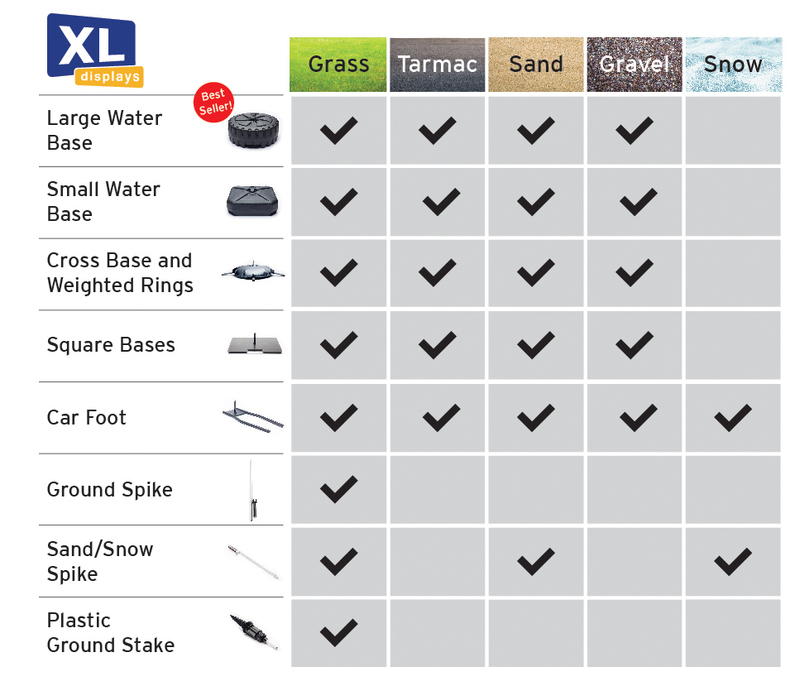 Other base options include a square base which is available in two sizes, a plastic ground stake and a sand snow ground spike. Our promotional flags are printed onto high quality 115gsm flag knit material using the latest dye-sublimation printing process. This printing process creates high quality print with exceptional detail, offering your brand maximum marketing impact. The artwork is printed directly into the weave of the fabric, ensuring longer lasting, more vibrant artwork that won’t crack, peel or fade after use. Our promotional flags can be machine washed to ensure they are kept in pristine condition after every use. See our guide for help on how to care for your promotional flag. The quality all-fibre black pole is lightweight and flexible yet strong and durable to ensure maximum versatility. Lightweight and highly portable, our custom printed flag kits come complete with a free carry bag to ensure safe and easy transportation. The specially designed carry bag features separate compartments for storing your flag pole and printed graphic. The carry bag also features an extendable shoulder carry handle so you can comfortably carry your promotional flag when required. Our flags are supplied in multiple sections with a simple, tool-free assembly. Each section of the pole simply push-fits on to the next and the printed flag graphic slides over the pole and hooks on near the bottom of the pole via an elasticated toggle. We pride ourselves on being able to deliver high quality products at competitive prices with fast turnaround - without compromising on customer service. We dispatch promotional flags within 72 hours upon receipt of print ready artwork. For more information on our range of outdoor flags, please contact us or call us on 01733 511030.